Go and search for adventure and wildlife on one of our four wheelers, encountering natural obstacles en-route. Guests are collected from the Sun City Welcome Centre and transferred through to Letsatsing Game Reserve; the transfer takes approximately 10 minutes. On arrival guests are met by their trail guide who welcomes them and takes them through the safety procedures. After the safety briefing, guests will go on the practice course for approximately 5 minutes. The purpose of the practice course is to ensure that guests are comfortable with the Quad Bikes before departing for the 30 minute nature trail. WhereWelcome Centre - Sun City Resort. What to WearTo wear suitable clothing for an outdoor adventure as well as comfortable closed shoes – running shoes, sneakers, boots (no sandals). Guests or SpectatorsKindly be at the Gametrackers desk, situated in the Welcome Centre at Sun City Resort, 15 minutes prior to the scheduled departure time as indemnity forms needs to be signed. A photo CD of your experience can be purchased at an additional cost of R400- per CD. The CD can only be purchased at the “Outdoor Adventure Centre”. Only Rand (ZAR) accepted. Unaccompanied minor (person under 18 years) - Parent/Legal guardian must sign the indemnity forms on the minors' behalf before departure. 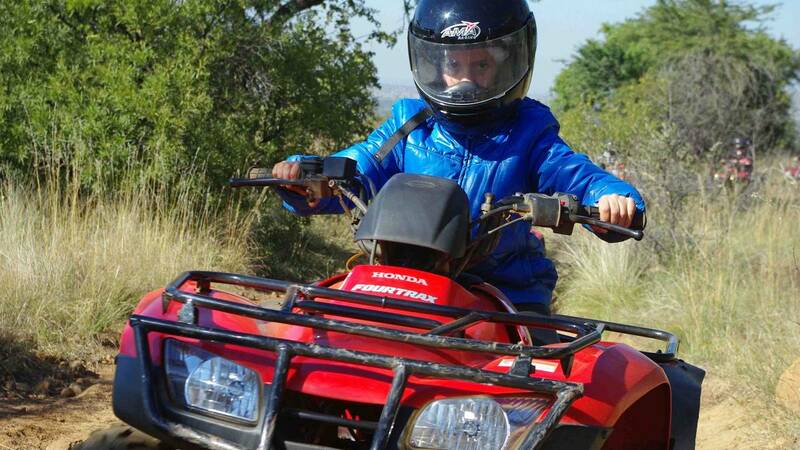 Children 5-7 years must be accompanied by an adult on the quad bike. Full adult rate and full child rate will apply. ExclusionsBeverages are excluded. There is a Kiosk at the "Outdoor Adventure Centre". Only Rand (ZAR) accepted. Credit/Debit Card facility is also available. Children 5 to 7 years of age will need to be lifted by an adult. Children 4 years and under are not permitted to partake in the activity.